From Apprentice to Master Fourteen-year-old Leonardo da Vinci came to Florence in 1466. This was the height of the Renaissance. He had grown up in the small town of Vinci. His father sent him to nearby Florence for education. For eight years, Leonardo studied under Verrocchio. He astonished his master with his ability to look closely at life and capture it on canvas. At the age of 20, Leonardo left Verrocchio’s workshop. He began to work on his own. He produced some of the world’s best-known paintings. For instance, his painting the Mona Lisa seems almost alive. It is much faded from its original bright colors. However, it still mystifies viewers with her enigmatic smile. Leonardo Studies the Physical World Leonardo was more than just a great painter. He sought the secrets of life. We know a great deal about what went on in Leonardo’s mind, thanks to his notebooks. Almost 5,000 pages survive. In them, we learn that he wanted to know how things moved. He drew detailed studies of birds in flight. He carefully drew the bones, muscles, and tendons of the wing. He was also interested in engineering and mechanics. He drew plans for irrigation schemes, central heating, machine guns, submarines, tanks, and life preservers. His interest in flight led him to design airplanes and parachutes. Leonardo’s helicopter design would not have flown. But many of his other ideas would have worked if they had been built. His desire to know also led him deep into the study of botany, geology, and astronomy. Leonardo wanted to look closely at the physical world. He wanted to learn only from what he could see for himself. This was a new way of learning. Up until this time, people who wanted to understand nature relied on what ancient teachers and writers had said. For example, medical doctors relied on the theories of Aristotle. He had lived 1,800 years before the Renaissance. Doctors used Aristotle’s works to support them. They believed that the balance of the four humors maintained the human body’s health. These were hot, cold, wet, and dry. People got sick when one of these humors was stronger than the rest. The process of actually cutting open a cadaver to see how the body worked was simply not done. A 15th-century physician would have been horrified by that idea. Leonardo had no such fears. He dissected at least 30 cadavers. He was trying to understand human anatomy by studying the body for himself. Leonardo also tried to understand the nature of paint. He experimented with new ways to mix and apply pigments. This ended in disaster for many of his paintings. At first, his results were startling. Artists from all over Italy came to admire the colors in his masterpiece, the Last Supper. However, the paint began to flake away almost as soon as it was finished. Many of his paintings have completely disappeared. The Last Supper as seen today is a shadow of its former beauty. New ideas and techniques always require risks. Leonardo was never one to back down from trying something new. At other times, Leonardo just had bad luck. He had made a clay form for a huge bronze statue of the Duke of Milan, Francesco Sforza. The form was used as target practice by invading French soldiers before it could be cast in bronze. His employers often did not care about his new ideas. They never gave him a chance to try them out. Sadly, Leonardo left behind very few works. There are only about a dozen finished paintings, parts of statues, and his notebooks. He spent the last four years of his life as guest of the King of France. From his notebooks, we can see that he thought of himself as a failure. “Tell me if anything at all was done...” was written on page after page. If you judge success by how many works were completed, then perhaps Leonardo was a failure. However, if you judge success by innovation and trying new things, then he can rank at the top. He left to the world three discoveries. First, we can command nature when we understand her. Second, we must learn about nature by observation. Third, the physical world cannot be understood by relying solely on overall theories. Studying details closely is important. It is the details that test the truth of a theory. People of this age believed that human beings had endless potential for growth. Leonardo came closest to realizing that ideal. His curiosity was boundless. Main Idea: Students will experiment with writing backwards as Leonardo did. Generate hypotheses about Leonardo's reasons for writing this way. a printed copy of the Leonardo Right to Left web page for easy reference. Be sure students have visited the Leonardo Right to Left web page, and encourage them to discuss what they learned from it. Make sure they understand what we mean by writing backwards. Refer to the sample of Leonardo's signature if there is confusion. Hold a pencil in each hand. Simultaneously, write backwards with the usual writing hand while writing forwards with the opposite hand. Having the one hand mirror the other hand's action seems to help the brain coordinate the movements. Have the students experiment with writing backwards alphabets and backwards sentences. Have them write backwards with pens and markers to make comparisons. Is one kind of writing tool easier to use this way than another? Distribute mirrors and show students how to position them to one side of their backwards writing to read it normally. A mirror also lets them check to see if they actually reversed all letters properly. Suggest that they try writing backwards messages to a partner who can then decipher them with a mirror. Did left-handed or right-handed students have an easier time writing backwards? For someone who learns to write backwards as easily as they write forwards, what advantages might there be to backwards writing? From the evidence they have gathered so far, ask each student to write down why they think Leonardo wrote backwards. Post these hypotheses where they are visible to everyone. Suggest that students refer back to these hypotheses as they explore this web site and others and examine published materials to learn more about Leonardo. Remind them that different authors will state different opinions about this question but no one knows the truth. Some of your students may come up with ideas for experiments to test some of their hypotheses. If so, encourage and support them! Point out to students that not all languages are normally written from left to right. Hebrew is normally written from right to left. Traditional Japanese and Chinese are written from top to bottom starting at the right side of the page. Ask if any of your students know of other languages that are not written left to right. If you were given the task of inventing an entirely new written language, which direction would you want it to be written in? Why? Read pages 20-23 about St. Peter's Basilica. Take note of all the various architects of St. Peter's. 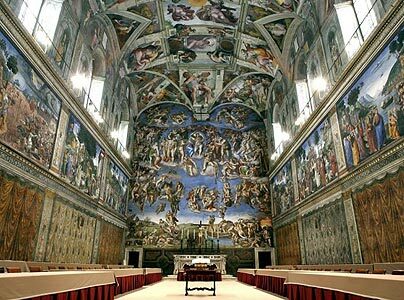 Your exercise for the week will make you realize how difficult it was for Michelangelo to paint the Sistine Chapel. You first need to crawl under a table, tape a piece of paper to the underside, and draw laying on your back. Use pencils, crayons, or markers for your tools. Do not use paint. It makes a mess. 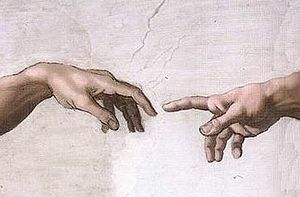 I find the best portion of the ceiling to recreate is the Creation of Adam's- Hand of God. Drawing hands are wonderful exercises in movement, connection, and scale. The second item is to draw a small box away from the vanishing point. Then draw light lines from the corners of the box to the vanishing point. This is the vanishing lines. Watch the video to finish the rest of your drawing.